10 factorial (denoted by 10!). 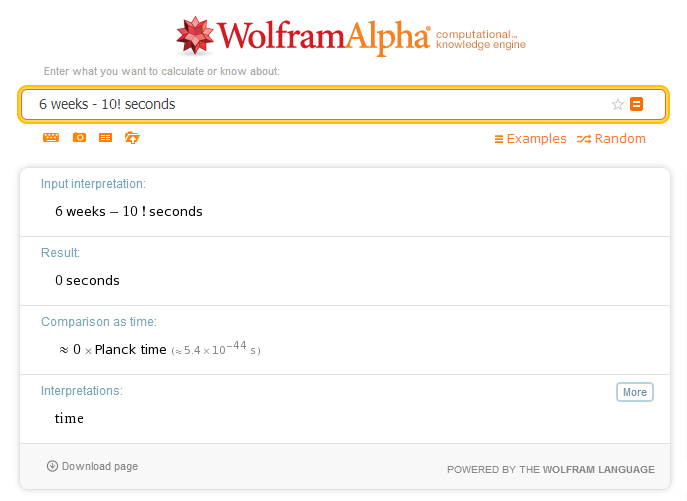 Down to a single second, the number of seconds in 6 weeks is exactly equal to the numerical 10! Very strange! One thing you could do is split the 6 weeks calculation into factors, and see it for yourself. The result is all numbers from 1 – 10. The most amazing factoring I’ve ever seen. If you are too lazy to calculate it yourself, go to this WolframAlpha calculation and see it for yourself. It subtracts 10! seconds from 6 weeks (the result is exactly 0). Apples and Oranges, I know, but the 6 weeks refers to seconds in 6 weeks, here. Salutes to the person who discovered this.